Turns out the most indebted generation to date is the least equipped to manage their debt. Like we didn't know that already. 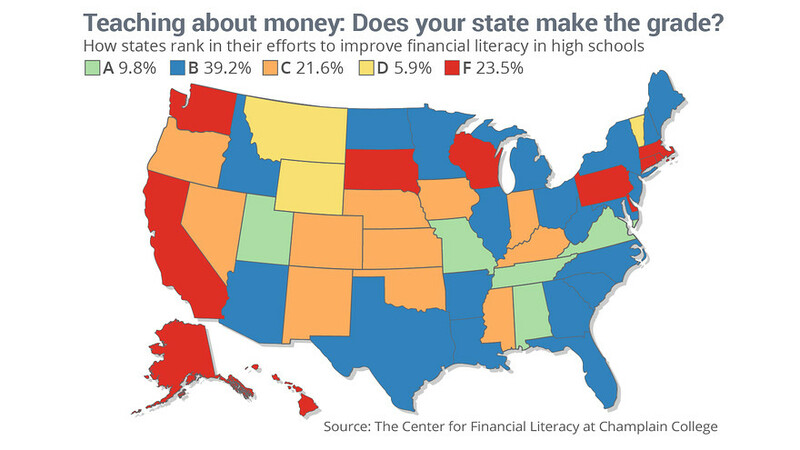 This cheerful news comes from the Center for Financial Literacy at Champlain College, whose 2015 National Report Card on State Efforts to Improve Financial Literacy in High Schools had few improvements to actually report. Apparently, just five states require high school students to take a class about money, with over 50 percent of states having little or no formal financial education requirements. Essentially, over half of high school educated students in the United States could be considered financially illiterate. This coming from one of the most materialistic and consumerist countries in the world. Slow clap. Don't worry - this lack of a proper financial education extends well beyond high school. College students poised to take out an average of $30,000 in student loans during their four years at school will scarcely hear the words "financial education" while working towards their $80,000 degree. Federal law does require colleges to provide first-time borrowers with student loan counseling (through this largely ineffective Department of Education website), but most students won't discuss their finances again until their graduation exit interview. Moreover, students tend to view this experience as "just another requirement of the financial aid process rather than a learning opportunity" and do not comprehend the information provided, according to John Pelletier, director of the Center for Financial Literacy at Champlain College. This is supported by the 13.7 percent default rate on student loans. Financial decisions made at the tender age of 17 tend to haunt borrowers well after graduation. About one third of white student loan borrowers and half of black and Hispanic borrowers all under the age of 50 wish they would have found another way to finance their education, according to a depressing survey from Pew Charitable Trusts. And for the cherry on top: While college grads are wallowing in a pool of student debt regret, two- and four-year universities are profiting off of their students' financial misery. "Professors and administrators ultimately rely on these loans for their take home salaries and benefits," explains Pelletier. "In 2014 approximately $134 billion in federal student loan debt and grants was used by colleges for expenses." Personal Finance 101 may be our only ally in the battle against student loan debt. Our government's failure to take full ownership of the crisis, or to provide any substantive relief, leaves two options: Take financial education into your own hands or live a life beholden to your bank account. This post originally appeared on GenFKD.com in October 2015.